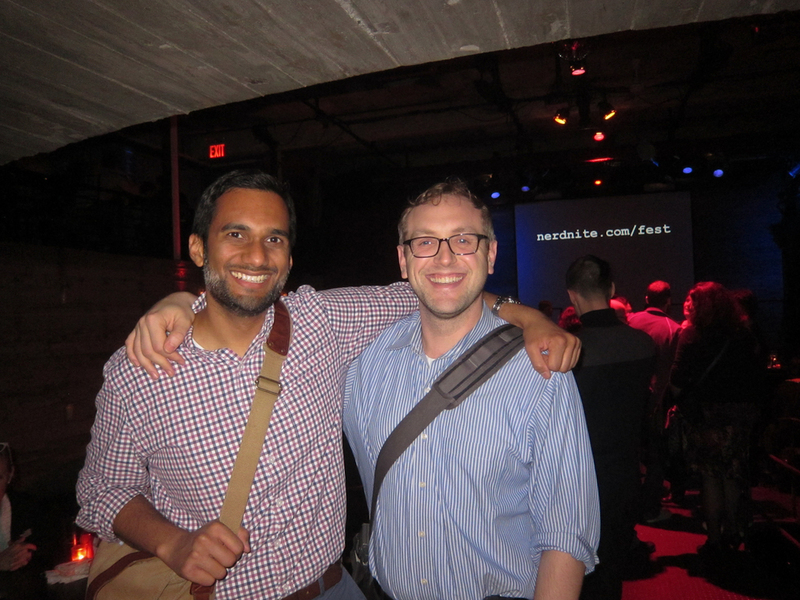 Last Friday was the 6th season premiere of New York City's Nerd Nite at the Galapagos Art Space in DUMBO Brooklyn. The evening included cool talks by Manish Engineer ($300 Million For a Painting of 2 Guys Playing Cards?) and Rachel Spurrier (Purity Balls: Father-Daughter Dance Meets Abstinence Rally). We were also joined by world renowned harpist Mia Theodoratus and DJ Soul Korea. There was even a dry t-shirt contest. I had so much fun presenting my talk (3 Easy Steps to Create Star Trek's Utopian Future). My favorite part was hearing from a woman who spoke to me after and said, "I wish I could go back in time and tell the 12-year-old version of me that nights like this will exist in the future - it would have made me feel a lot less weird about being a Trekkie and much more cool." That's the greatest part of Nerd Nite - it's a celebration of everything that makes being a geek so cool. Thanks to a generous friend, my talk is now up on YouTube. Check it out if you couldn't make it to the real thing. For more on the psychology of first contact, read the article that inspired this talk. Be sure to visit a future Nerd Nite in your local area for more cool nerdy talks. Today is First Contact Day. Well, it will be in 50 years. "[First Contact] unites humanity in a way that no one ever thought possible when they realize they're not alone in the universe. Poverty, disease, war - they'll all be gone within the next 50 years." So, with a half century to go, what would it take to make Star Trek a reality? The psychology of first contact indicates we need to do 3 things – end prejudice, foster cooperation, and develop empathy for aliens. Our first challenge is overcoming bigotry. We can't work together if we hate each other. So step 1 in creating Star Trek's utopia is ending prejudice. The problem is humans are wired with a self-serving bias - we really like ourselves and the groups we belong to. Think of it as a psychological immune system - we take credit for good stuff ("I was promoted because I'm smart") and blame others when things don't go our way ("I didn't get promoted because my boss is an idiot"). When you combine this with the ingroup/outgroup bias (see my post on jocks and geeks), it's easy to understand why we can be so closed-minded to people who seem different from us. Learn about the other group. Make contact with the other group. Develop empathy for the other group. This is exactly what happened in the United States after desegregation - when Blacks and Whites were allowed to interact with each other, friendships eventually developed and groups became less scared of each other. First contact alone wouldn't end prejudice. Look at District 9 - just because we meet aliens doesn't mean we stop being bigots. In Star Trek, first contact occurred after decades of a genocidal war that culminated in a nuclear holocaust. The planet's cities and governments were destroyed. It's likely that the horrors of global devastation led to a period of increased empathy for one another. When you combine that with a lack of nationalistic identity (since there're no governments), it makes sense why a post World War III Earth was ready for tolerance. Working on large goals, like preparing for the first warp flight, helps people overcome their differences. Having developed empathy for one another, the humans of Star Trek started to work together on big projects - ending poverty, eliminating diseases, and exploring the final frontier. This type of collaboration is very hard for us to do. Our history is full of "tragedies of the commons". If no one person is responsible for a resource, we deplete it (think of climate change or the shared candy bowl at work). This gets back to the self-serving bias - we do what's in our best interest, not the group's. The same is true of the prisoner's dilemma - even when it is in our best interest to work together, most of the time we don’t. Is there any way humans can overcome our biases and collaborate on a large scale? Yes, absolutely. It requires regulation, small social groups, clear communication, superordinate goals, and reinforcement. To overcome common pool resource problems (like poverty), some type of regulation is required. For example, a small portion of the world cannot be allowed to use the majority of the planet's resources. It’s hard to imagine global regulations being implemented now, but a unified world government, like what emerged after Star Trek's World War III, could make it so. Large social groups also need to be broken down into smaller ones. This builds empathy and a better use of resources. Maybe the few humans who survived Star Trek's nuclear holocaust became accustomed to living in small groups and shared what they had. Trusted communication between groups cuts through the prisoner's dilemma (just like the hotline between Moscow and Washington during the cold war). I have no clue how they managed to do this in Star Trek after World War III – Earth had limited infrastructure and no governments. Maybe the Vulcans lent humans communicators? Requiring groups to work together and accomplish superordinate goals is one of the best ways to reduce competition. This was famously demonstrated in Muzafer Sharif's robbers cave study - groups of boys who hated each other learned to get along when they had no choice but to cooperate. Remember how connected the world felt when Neil Armstrong landed on the moon? Now imagine a space project that requires participation from the whole planet. Working on such a project could easily unite humanity (especially if we've just discovered the existence of alien life). Lastly, cooperation and responsibility must be rewarded (just like H.O.V./carpool lanes). While the possibility of advancing science, developing new technologies, and improving quality of life sound great, psychology maintains that people do what is in their best interest, not what is in the best interest of groups. Somehow, Star Trek figured out a way to encourage people to "work to better themselves". This is the key ingredient to creating a utopia. Just meeting aliens won't encourage us to work together - we need concrete rewards for cooperating. Who doesn't like a Vulcan? They look and talk just like us. Humans are far from united. We fight about race, ethnicity, nationality, religion, region, and lots of other stuff. Whenever we experience conflict, we unite against common enemies (e.g. usually the folks who aren’t like us). If aliens come along, make humanity feel more united, and we learn to cooperate on a global scale, then it's going to be VERY easy to see aliens as our common enemy. This actually happened in the Star Trek mirror universe - instead of welcoming Vulcans with open arms, Zephram Cochrane looted and plundered their ship. Anytime we see someone as less than human, we do really bad things to them. That's the first job of war propaganda - to dehumanize your enemy. The only way to prevent us from hurting our alien visitors is by developing empathy for them. Our best hope would be finding a way to communicate (but a universal translater is about as unrealistic as a Heisenberg compensator). Star Trek gets around this issue because Vulcans look a lot like us (and they somehow speak English). The aliens we’re likely to meet probably won’t look like Vulcans. Think of the prawns from District 9 or some of the strange deep-sea creatures we’ve found – that’s what aliens will look like. This is bad news because the less an animal looks like us, the less empathy we have for it (which is why we kill insects without thinking about it). It's possible, but not likely. The EU is one model of a Star Trek future. It's completely possible that in the wake of a global catastrophe, humans may overcome our differences, develop empathy for each other, and collaborate on big picture shared goals. We've actually done this before. The European Union was created in the wake of World War II as an attempt to escape nationalism and force economic cooperation. For the most part, this federation has succeeded. The problem is motivating people to cooperate and developing empathy for aliens. The EU functions because there are strong economic incentives for countries to work together. Star Trek throws all those incentives out the door (literally – there is no money in Star Trek). Without rewards, people continue to do what is in their best interest, not the group’s. Lastly, if we can’t find a way to talk to extraterrestrials, we're not going to develop empathy for them – in fact we might kill them. I remain an optimist. There’s a chance that our scientific findings, developed in a world where no other intelligent life exists, just won’t apply to a post-first contact Earth. Meeting aliens might cause us to feel, think, and act radically differently. We have to wait and see. 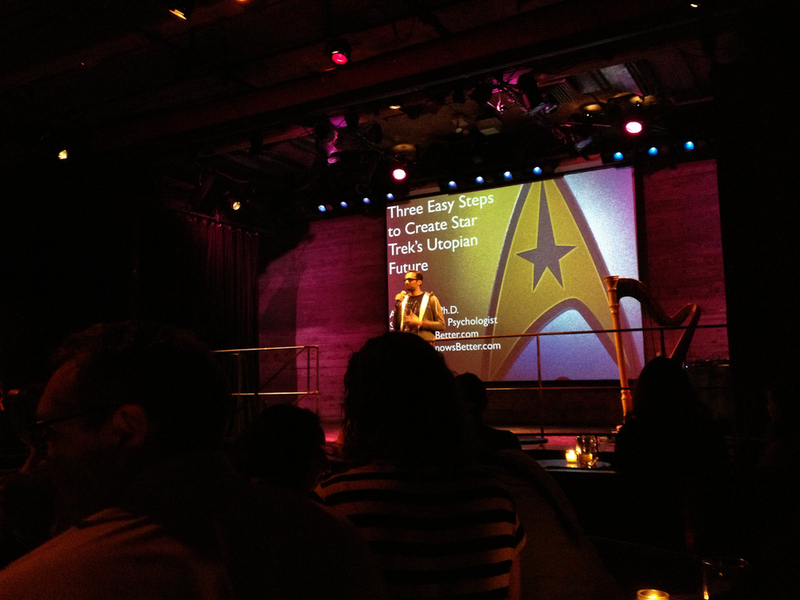 September 16, 2013 Update: To see a live version of this talk, check out my NYC Nerd Nite talk: 3 Easy Steps to Create Star Trek's Utopian Future.